Click here to see larger picture. “I’m not sure anyone can really know that,” I say, my tone bleakly honest. It has taken our writers’ group some time to train me to honesty and I’m practicing what I’ve learned. I write fiction, and though I no longer consider this a license to falsify human nature, or bend plots, or fight my own characters, I am still in training. 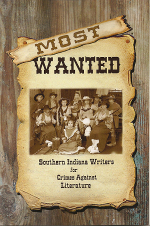 The title they are considering for our next book is subjective, to say the least: “Most Wanted.” They are giving me a lot of rope here (joke intended). It remains to be seen whether I can keep from hanging myself. Flustered, Evan tripped, lost his balance and fell forward. Thick branches caught him, so he hung at an angle like an insect in some strange thorny web. The thorns pierced his shirt, face and hands. His feet were still touching the ground. Tears blurred his eyes; he closed them tight, then opened again, seeing better. When he looked at the ground ahead, he shook. A snake was coiled about three feet from the bush where he hung. Black eyes stared at him. The hairs stood up on his neck and back. Evan closed his eyes. He was going to be bitten and die on this bush, his skeleton found years later by some kid. Josh laughed. Belderes’ attitude toward sunken treasure and treasure hunters was well known — and not a good one. How does country air smell? Fresh, like our sheets after my mother collects them from the clothesline. Of lilacs and peonies, of mint and rosemary. I fill my lungs with the bouquet of this Indiana camp, and I’m home again. Another Hoosier summer awaits; days of endless fun, and skies so dark at night you can see into the next galaxy…. At sunrise Daddy will rattle metal spoons against metal pansand holler, REVEILLE, our bugle call, just like when he was in the Navy during WWII on the USS Cliffrose. No one was allowed to sleep in then, so why should now be any different? But we don’t want to sleep our days away, because there is too much fun to be had. The coal train had been through that afternoon, and Veeda and Willis had been coaling. There wasn’t a station stop in Hazelton, and the tracks didn’t run straight through, but took a sharp turn around a hill in the middle of town and pulled in under a coal tipple. Veeda and Willis would push an old red wheelbarrow down the line and pick up chunks that spilled from the tipple or train. Veeda would sing, usually a church song about having wings, a song about flying to Jesus, although anywhere would do. Every piece of coal Veeda picked up, she thought, You and me, neither of us goin’ nowhere. We’ll both burn out right here in Hazelton while the train runs on. When Dad was diagnosed with cancer at the relatively young age of 68, the initial reaction was sadness and fear. He had metastatic melanoma, and all of us understood the prognosis. My grandfather had died of lung cancer back in the late 1960’s, a time when treatment options were slim. When the mole on Dad’s back began to grow, so did his fear. He couldn’t face going through what he’d watched his dad endure, so he put off going to the doctor. With each surgery, each scan, each treatment, we knew that eliminating a tumor in one place was only a temporary fix, a way to forestall the inevitable, but when time is working against you, stalling is the best you can do. It wasn’t that his parents didn’t love him. He knew they did. But he also knew that in some circles a child with no magical abilities was considered a disgrace to his magical parents. His youngest brother, Rist, would leave in the morning for the Academy of Magics — following their sister, Steena, who was already distinguishing herself as a student of great power, and their brother Adeel had just been certified as a mage and offered a treasured teaching position at the academy. Mum had taught at the academy and Da — well, Da is just Defender of the Eastern Border. Then there’s me. Not that first glimmer of magic. Crans remembered the looks of proud approval showered on each of his siblings as they first showed signs of magical power. It was a look he did not ever remember them giving him. He stuck the Whitepink into his buttonhole and trudged homeward. Face it, Crans. They will never look at you that way. I check my rear-view mirror for the boy’s image. Two hundred miles down, three hundred more to go. I see him now in his little black coupe. Is he smiling at me? No, he’s just smiling, I think. We travel caravanstyle, both vehicles loaded to the hilt with the past eighteen years and two days of his life–guitar and sheet music; boxes of books and unfinished manuscripts; new bed linens for the dorm, and electronics like CDs, video games and his PC. His girlfriend insists he take her pillow. She wants to be in his thoughts when he drifts off to sleep. Dream on, girl–he’s forgotten you already. This male is on the scent of a new life. His older brothers easily managed to do the same in our hometown, but does he? Oh, no, not Jordan. He makes a huge production out of it, moving so far away to a renowned college town. Billy was hanging on every word, a perfect time for Jack to stop talking and take a big bite of pie. I was sitting in the swing, on the porch, thinking about my six granddaughters when I saw Terry, my favorite granddaughter, coming up the walk. I can’t believe that she is 15 years old. It seems like it was only yesterday I watched her dance the role of Clara in “The Nutcracker”. Just look at her long black hair and her build. Yes, she does look like a ballet dancer. Maybe she will become one.